Fleets At War! 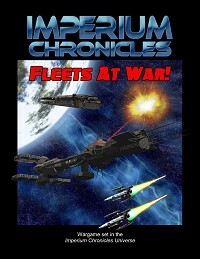 is a new space wargame set in the Imperium Chronicles RPG universe. Fleets at War! is a tactical starship combat game played on the floor or a large table with cardboard counters representing capital ships, fighters, and other space craft. Simplified game mechanics let players engage in small skirmishes all the way up to large-scale battles involving dozens of ships. Fleets at War! uses the IMP System that reduces the number of die rolls necessary during play. All other calculations are done by referencing a chart of two opposing attributes (ex. Damage vs. Armor) to find a result. The goal of this system is to speed up play and allow for large-scale battles. Each counter in the game represents a single starship or a flight of four to five fighters. An inch equals approximately 0.2 miles, or a mile equals 5 inches. Each game turn equals roughly 2 to 3 minutes. Each class of ship (i.e. : heavy cruiser, destroyer, frigate, etc.) has a one- or two-sided card listing all the stats for that class, including its offensive and defensive capabilities. 6/1/2012 - Fleets At War! is now available from Wargame Vault as a pdf download - link. 3/17/2012 - They are quickly approaching beta testing of the game and are looking for playtesters. More information about Fleets At War is available at their Imperial Chronicles Facebook page including some images of counters. If you are interested in playtesting please drop them an email.